As leaders from the US, Canada and Mexico gather for a summit, the BBC's Stephen Gibbs travels to Nuevo Laredo to meet Mexican truck drivers at the heart of a cross-border dispute with their powerful neighbour to the north. 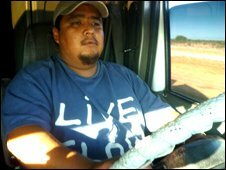 Israel Camarillo kisses the wooden crucifix hanging from his rear view mirror, crosses himself, and edges his 18-wheeler juggernaut onto Highway 85. He has been driving 18 hours, without a significant break, from Mexico City. The sun is rising over the parched scrubland in front of us. We are on the final stretch. Nuevo Laredo, the busiest land frontier in Latin America, is 200km away. The road is nearly empty. 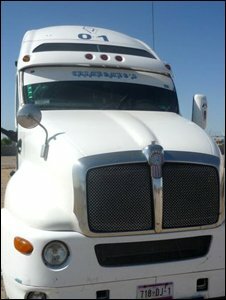 The few other trucks on the road are, like us, heading North, to the United States, and ultimately, American consumers. Not long ago that market appeared insatiable. Now it seems on a crash diet. "I used to make this round trip eight times a month," he says. "Now I am lucky if I go there and back twice." The Mexican economy, the 12th largest in the world, is in the midst of what might be its worst recession since the 1930s. And it is almost entirely due to the collapse in US demand for its exports. Some 80% of Mexican exports go to the US. Over the last 12 months, many US companies, which have assembly plants in Mexico, have drastically reduced, or even stopped, their production runs. Nowhere is that more obvious than at the Laredo border crossing. Two years ago, a line of parked trucks stretching 14km was a regular sight at the approach to the frontier. Last week, you could cross from one side to the other in less than 20 minutes. Israel has to pull over before he reaches the border. US transport regulations prevent him from taking his cargo of Venetian blinds to its final destination in Los Angeles. So another, specially licensed, Mexican company will collect his trailer and take it across the World Trade Bridge which separates the two countries. It will then be handed over to an American haulage company for the final leg of the journey to California. "It makes no sense at all," says Israel as, finally, he thinks about getting some sleep. The issue of cross-border trucking remains a sore point between the governments of the US and Mexico. According to the 1994 North American Free Trade Agreement (Nafta), Mexican trucks should be able to operate in the United States, as US trucks and Canadian trucks already do in Mexico. But last March, the US Congress withdrew funding for an already delayed trial scheme to allow the trucks in. Mexico retaliated by imposing tariffs on $2.4bn worth of American imports - from California grapes to Oregon French fries. Those in favour of the ban, including the powerful US Teamsters labour union, say Mexico has failed to comply with basic safety standards regarding its trucks and drivers. Those against the move, including the Mexican government and American trade groups, say the dispute is costing businesses hundreds of millions of dollars, and is based upon protectionism. The dispute will likely be raised by President Calderon in his meetings with President Obama in Guadalajara. But some believe it is a side issue to a far more urgent crisis. "We don't want to work on the other side of the border anyway," says Luis Moreno Sesma, General Manager in Nuevo Laredo of Canacar, the Mexican truck owners' Association. He says the US authorities appear biased against Mexican drivers. "They are waiting for us like wolves hunting baby deer," he says. Both governments, he says, should do more to help legitimate trade, and specifically reduce fuel costs of transport. "Cargo has fallen by 50%. If the economy of the United States does not recover quickly the consequences for us will be disastrous. We are on the road to mass unemployment."